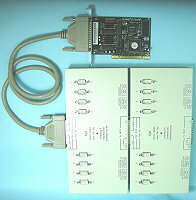 Support 8 GROUND Isolated RS232 and 8 GROUND Isolated RS422/RS485 serial ports in one PCI slot. Just one IRQ for 16 ports. Support Windows NT/2000/XP/Vista system driver. Support Windows 7 system driver. Support Linux and SCO Openserver System driver. Support card and metal box structure.